Moschino Cheap and Chic was all about the 60s from color to tailoring. Pink, orange and green were in many of the pieces. Many of the fabrics were knits with crochet detailing and Moschino’s trademarks – bows, lip prints and pearls- were on several of the skirts and dresses. I especially like the pieces with the color-blocking patchwork. House of Holland was all about bright colors for their show- a refreshing change from the dark colors typically seen on the fall clothing runways. Another interesting aspect was the flare-bottom leggings. 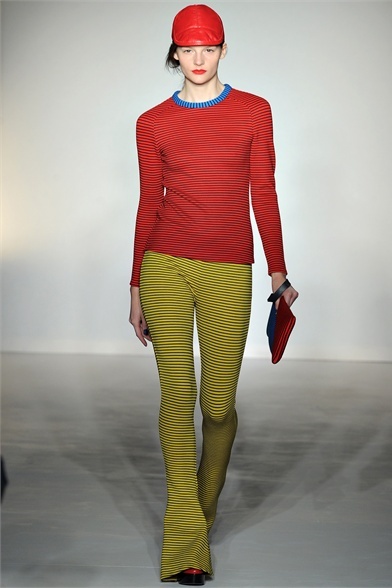 Zig-zags and stripes were the main patterns incorporated into House of Holland designs. I am interested to see how these looks will translate off the runway, House of Holland could hold a lot of power in dictating how we do our fall fashion shopping. Temperley London’s collection this year was titled “Renaissance.” The looks channeled classic English Tudor royalty style with silk and jeweled necklines. Rich hues such as brown and red were incorporated in many of the looks. My favorite piece was a dramatic black silk floor-length gown with buttery gold fabric on the inside. Issa London is a favorite of the Middleton sisters. Designer Daniella Helayel’s looks are regal yet sultry and inspired by a Trans-Siberian journey she said. The colors included blood orange and navy blue with several touches of golds and blacks. The show started with her ready-to-wear looks including blue wool twin sets and dresses and ended with classic silk gowns. i love that red leather dress!! stunning collection! Very beautiful fashions! I love these clothes, so stylish!! Thanks.